While trying to come up with the best term that describes Jerry Nelson, ones mind turns inevitably to the words multi-talented and multi-faceted. Both words contain the prefix "multi", meaning many, and the words denote the numerous talents - and characters - contained within him. From his humble roots in Oklahoma to his hand in creating cultural icons (The Count Von Count, Floyd Pepper, Gobo Fraggle, Robin), Jerry has accomplished much in his long and distinguished career. Although you dont ever see him, you know and appreciate when hes there. NELSON: I was born in Oklahoma in 1934. I lived there with my mom until I was about 6, then we moved to Washington, D. C. and I grew up in that area. Was it a job related move? NELSON: Yeah, as a kid it was my job to go to school. It was during the war. My mom and dad were divorced, and she took a job with the Navy Department, so we moved there for that. I spent summers with my grandparents in Tulsa, and the rest of the time I lived in D.C.
NELSON: Well, I was probably 7 or 8. I know I was already in school. I remember about three schools in Oklahoma. One would have been a kindergarten, one would have been a first grade, and the other one would have also been first grade or the beginning of second grade. I know when I started school in Washington, I was in the second grade. The reason I remember one of the places in Oklahoma was because is was a one-room schoolhouse. I was in a class room with all age kids and the teacher would move around, kind of like an arena. That was a good learning experience early on. NELSON: Yeah, going to Washington was a big change in my life. It was a big school. The first school I went to in Washington, I had to wait after school because my cousin went to the high school next door, and I used to wait in the playground so we could go home together. We had to go by public transit that involved a streetcar and a transfer to a bus. It was fairly complicated travel for a second grader. During those days wed listen to radio. Thats probably where I became fascinated by voices and accents. I would hear names and think, "Oh, thats the same guy that does this other voice on that other show." That was probably where I became interested in the fact that you could regulate your voice and do different characters. NELSON: Radio was more of a family thing, although in my family when we watched TV we would do that together as well. I suppose today everyone has their own TV or computer or whatever theyre interested in and it certainly seems more fragmented. Society is more fragmented. People, rather than staying with their nuclear family, tend to adopt families who are more in tune with them. 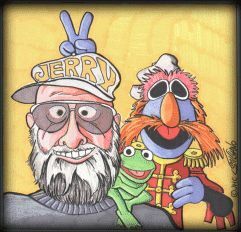 Since the sixties, Jerry Nelson has been a core member of the Henson organization. One of the major things that Jim saw with puppets, and Bil Baird also, was that they werent just a childrens entertainment, that they could also entertain and educate adults as well. 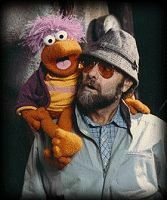 Jim was the one who really connected in this struggle with "The Muppet Show", but it took the success of a childrens show to enable that. People who had never seen "The Muppet Show" used to ask me, "What is that?" and I used to say it was an entertainment program for children of all ages. Thats the way I always thought of it, because there were different levels that appeal to different intellects, different age groups. The jokes were there for very young minds, but the jokes were also there for the older audience. Thats the interesting thing about "Sesame Street". Young children would watch it over and over again and theyd watch the same show at the end of the week. When they first started, at the end of the week, theyd run the full weeks programs and children would watch them all over again. Nowadays, kids will do that with videos so that they know it by heart. They have minds that are busy looking at other things. Theyll watch the storyline, then theyll watch a character, then theyll watch the background. Eventually life comes along to distract us. "Sesame Street" is on what, its third generation now? NELSON: At least. That was the interesting part. When kids were 6 or 7, theyd go, "Aw, I dont watch that stuff anymore. Im too old for that. Thats a childrens show." Then somewhere in their teens theyd start watching it again, and then in college theyd start watching it again. It has a perennial quality to it. Nothing is really too dated, either. NELSON: No, not really. You can look at some of the haircuts, maybe that would date it, but not the themes or the humor. What were your interests in school? NELSON: By the time I got to high school, I was interested in country music and at some point in school, I dont know how it happened, I got involved in a school play. It was fascinating and a lot of fun. As a youngster, my mom had put me in some group that traveled and did shows for Jaycees and Lions Clubs called Juvenile Review that a guy had put together. We did shows like "Tom Sawyer" and "Hellzapoppin, Jr.", which was basically tried-and-true vaudeville routines. We also sang on the radio in the Washington area. I still like country, but now I like jazz and classical music as well. I realize music has shades for various moods and youre not restricted. I stopped playing guitar when I was focused on jazz and thought, "Well, I cant play jazz." At some point, maybe when the 60s movement came about, I started playing again because I thought, "Oh, I can play that." In terms of acting, that was put on hold when I went into the army. I was in the army for two years and went to Japan. Was this right after high school? NELSON: About a year afterwards. This was at the tail end of the Korean conflict, so I got the GI Bill and was able to go to school. I went to school for about a year and a half and thought, "Well, Im not really doing anything here. If its acting I want to do, I should be in New York studying acting." I felt like the thing to do was forget about school and pursue acting. NELSON: I got back from the military in 56 and went to school from 56-57, moved to New York in 58, and stayed there for a couple of years. How big a transition was it to just move to New York? With Gobo on his shoulder, Jerry Nelson can't help but enjoy the company. NELSON: Well, there were other things like life going on. I dont know if I should get into that aspect of my life. My own sense of responsibility also came into play... The things you do that you think you should do and it turns out theyre mistakes, so you just forge ahead. Thats the way life is. You have to say, "That was a mistake", and move on. I think all of these things, especially for a performer, are fulfilling in a different way, because thats one more unique experience you have that you then can relate to something and go, "Ah, I know what that is." It becomes a reference for other things. New York is a great place for studying people. There are great characters in New York. The old New York cab driver hardly exists anymore, but it used to be that most of them were philosophers in their own right. It was always quite a trip to take a cab ride in New York, but now its not so much anymore. I struggled along in New York, and I did some acting in early, early TV shows like "The Defenders" and "Naked City"
I think one was a roll-on deodorant.